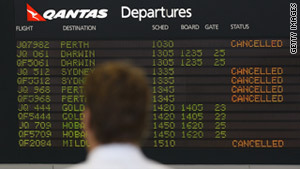 Airlines cancel flights due to volcanic ash at Melbourne Airport on Tuesday in Melbourne, Australia. (CNN) -- An ash cloud drifting around the world for a second time after spewing from a Chilean volcano more than two weeks ago is once again grounding commercial jets and stranding passengers in Australia. After earlier announcing that all scheduled international flights in and out of Sydney and Melbourne were cancelled for Wednesday, Quantas said most of those flights will resume. However, trips across the Tasman Sea to and from New Zealand remain cancelled indefinitely. Virgin Australia airline also said its New Zealand flights were cancelled indefinitely. Virgin said Wednesday it was resuming service from Adelaide, Melbourne, Canberra, Sydney, Albury and Newcastle. The June 4 eruption of Puyehue-Cordon Caulle volcano in the Chilean Andes Mountains forced the shutdown of flights in and out of at least 10 Australian cities Tuesday. The same ash cloud spawned by the fiery South American volcano also forced major flight cancellations Down Under two Sundays ago. The airlines' decision to ground the flights was based on information provided by the Australian Volcanic Ash Advisory Center. "The volcano has remained active and as of the 9th of June, the ash plume from the original eruption has travelled across the southern Atlantic Oceans and under Africa to stretch into the Indian Ocean," the advisory center stated. "It is not unprecedented for volcanic ash to remain suspended for long time periods." The eruption of the Chilean volcano sent plumes of smoke more than six miles into the air, filling an otherwise bright blue sky that day with a massive stream of white smoke. Chile is located on the so-called "Ring of Fire," an arc of volcanoes and fault lines circling the Pacific Basin that is prone to frequent earthquakes and volcanic eruptions.